Samajwadi Party chief Akhilesh Yadav Monday said his party is not only in alliance with Mayawati’s BSP (Bahujan Samaj Party) but with the Congress as well. 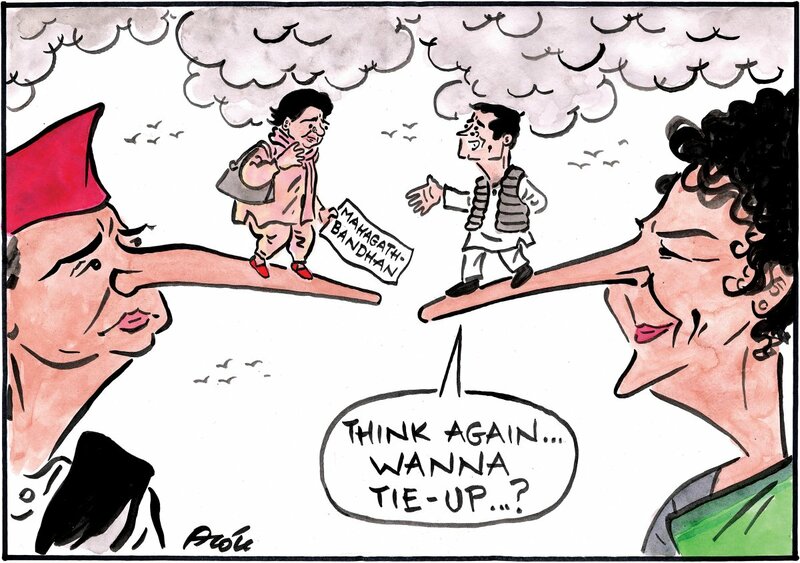 Alok suggests Priyanka Gandhi Vadra’s first roadshow in Lucknow after taking over as the General Secretary of Congress in Eastern U.P., followed by Yadav’s pro-alliance statement might bridge the gap between Rahul Gandhi and Mayawati to revive the anti-BJP political tie-up. 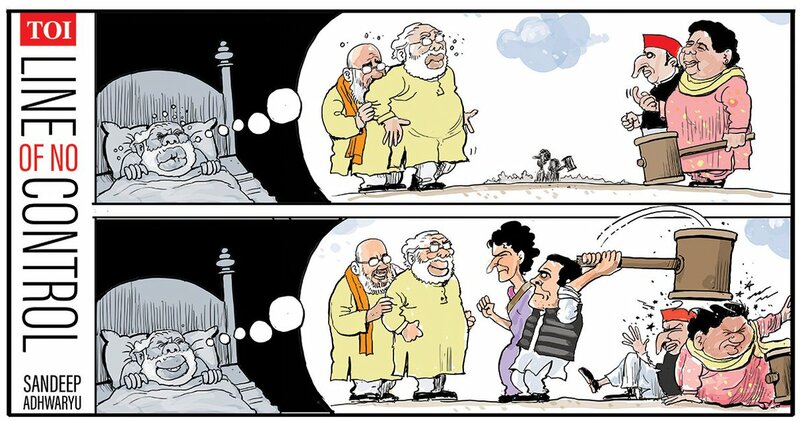 Appupen for Brainded India appears to suggest that the BJP may be facing a defeat in the Lok Sabha Elections. 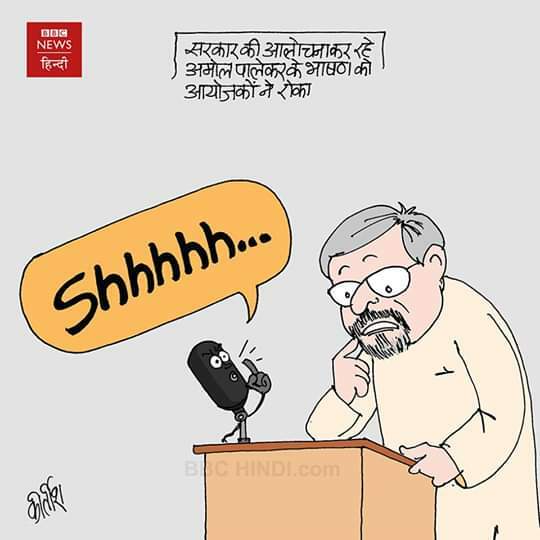 Kirtish Bhatt weighs in on the freedom of speech debate after veteran artist Amol Palekar was forced to cut short his speech at an event in Mumbai’s National Gallery of Modern Art for criticising the Ministry of Culture. 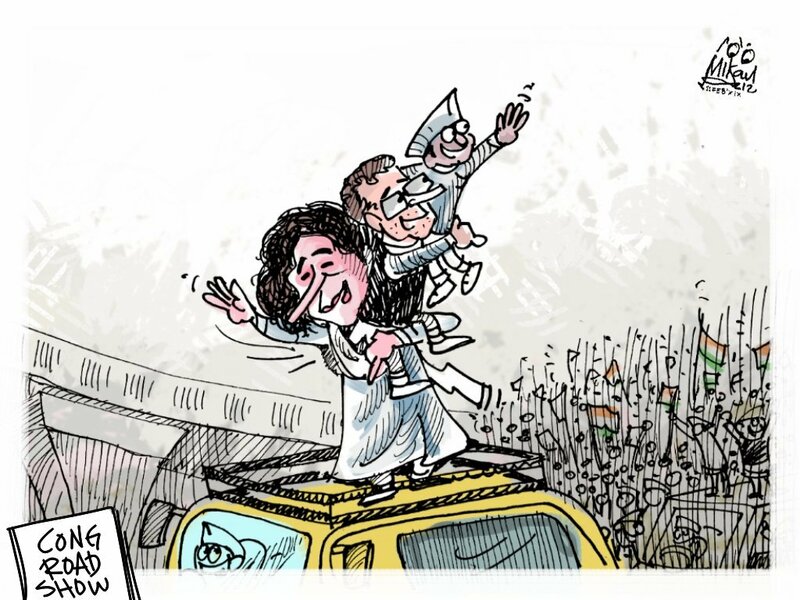 Manjul depicts Priyanka Gandhi Vadra taking charge of a Congress in ruins in Uttar Pradesh. Mika Aziz takes a dig at the Congress’s rally in Uttar Pradesh’s Lucknow, led by Uttar Pradesh Congress general secretaries Priyanka Gandhi Vadra (Eastern U.P. ), Jyotiraditya Scindia (Western U.P.) 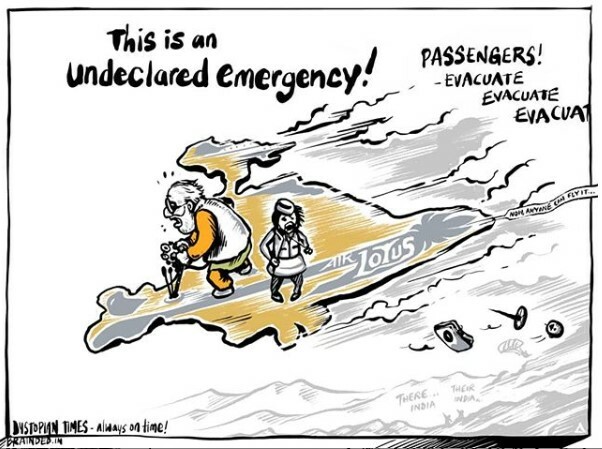 and party president Rahul Gandhi. 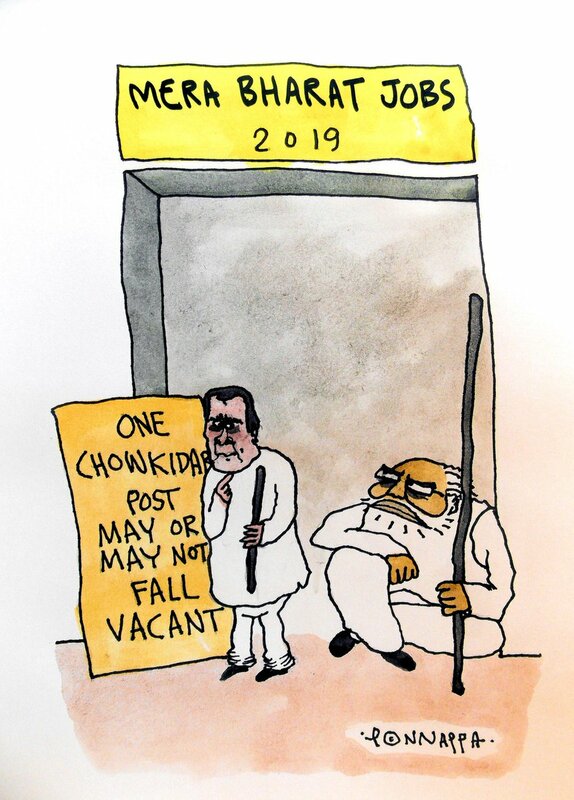 Nala Ponnappa takes a potshot at the Modi government’s failure to create jobs as he suggests that a “chowkidar” post may fall vacant after the Lok Sabha elections. 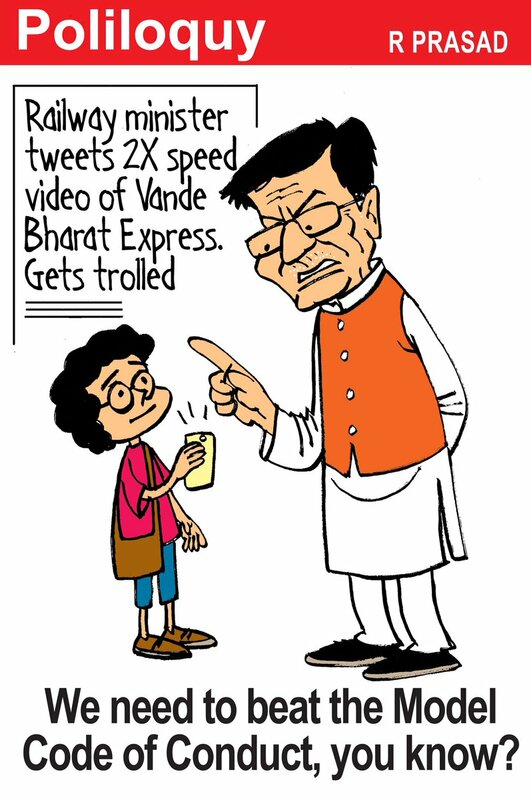 R. Prasad takes a jibe at Railway Minister Piyush Goyal for posting a doctored video of the Vande Bharat Express built under the ‘Make in India’ initiative. The Congress’ campaign in Uttar Pradesh, suggests Sandeep Adhwaryu, could end up benefitting the BJP at the expense of the SP-BSP alliance.